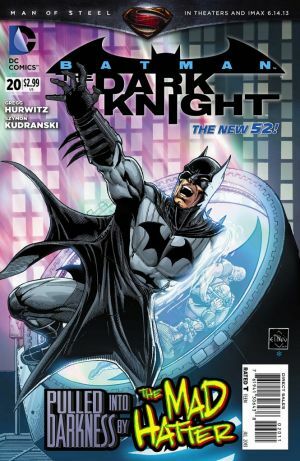 Batman investigates the murders while Natalya is kidnapped by the Mad Hatter. Despite his conviction that she was perfect, after Natalya leaves a large scar on his face he decides she is not his Alice and must be disposed of. Batman realizes that Natalya has been taken and races to find her. But he is too late and the Mad Hatter throws her out a helicopter to die on the bat signal. I could be very, very sarcastic during this review. In fact last week that was my gut reaction. Since then I’ve had time to cool down, realize there were more important things in life than bad comic books. But, I imagine as I get back into the books coming out this week I’ll find a couple of stinkers to ruin my mood. I don’t think anyone is surprised at Natalya’s death. People that haven’t read any Batman books before couldn’t possibly be surprised by her ultimate fate. Batman has kept his secret identity for a long time, that doesn’t happen when every girl he ever revealed his secret to managed to survive their respective story. What gets me about this issue is that Natalya’s death is meant to mean something. Unfortunately since everyone could see this end coming, the impact is lost. And since she has not been around for very long, we haven’t had time to see how much she meant to Bruce. Instead we had to be told how much she meant. Sure, we’re technically shown how much she meant. But it’s all done through dialogue, and it’s all layered so thick over the past several chapters that it was less subtle character building and more a flashing neon sign over her head reading “Road Kill”. I’m not too keen on the art. I’d love to read a Batman story with this art, but the shift halfway through the story makes it far too jarring. I hope Kudranski sticks around for the next storyline, since I would like to read a dark story with his art from the very begining. Sadly the writing probably won’t be up to snuff. The Dark Knight is currently next on my chopping block. I already get a lot of Batman per month, and out of all of those titles this is the most superfluous. I started reading with the Scarecrow story because I was promised a good run. It was decent, and this one was mostly decent. But a lot of the events are poorly executed to the point where I don’t see it worth my time reading these week by week, let alone taking the time to review them.